ISRAEL, Jerusalem with Kids – Jerusalem is extraordinary, intense, and confusing. Even to the seasoned traveler, it can be intimidating. So when we planned our visit to the Holy City with three generations of extended family—comprising four different religious backgrounds—we knew it was bound to be a memorable adventure for us all. To help you get the most from your family’s trip to Jerusalem, here are my recommendations of four must-visit places, one great place to stay and nosh (eat in Yiddish) when visiting Jerusalem with kids. Visiting Jerusalem’s Western Wall with kids. The Western Wall is considered by many to be one of the holiest sites in the world. Also known as the Wailing Wall, it is located in the walled Old City of Jerusalem and is the last remaining remnant of the first Jewish Temple in the world. It is a stunning, massive limestone remnant of the original temple that draws Jewish people and other communities from all over the world to touch its scared skin. But families cannot simply go up and touch the Western Wall and pray. You must first pass through an entrance to the Old City where you are scanned by security. Next, you may go down and approach the Wall where you will be separated by gender to respect the religious practices of the local Orthodox Jews, some of whom might even go to the Wall multiple times a day to pray. Please note in the photo the separation of genders in my family as well as the modest, casual clothes that may be worn to the Wall. It is respectful to cover a woman’s shoulders and a man’s head (children and men even wear baseball caps). A popular tradition is for visitors to leave handwritten notes to god in crevices of the wall. Find out more: A custom Old City tour can be arranged for your family through TravelComposer.com (more on tours in Activity 3). Spices and treasures at The Shuk in Jerusalem. Mahane Yehuda Market, also called The Shuk, is an exciting and entertaining labyrinth of 250 retail shops located right outside of Jerusalem’s Old City and almost anyone can point you to its location. You’ll find plenty of falafel stands and jewelry stores, plus markets brimming with spices, textiles, oodles of awesome Jewish “tchotchke” and Judaica, wine, and more. To many outsiders, the market is extremely colorful, loud, and foreign–yet a fun place to explore. Enjoy the fragrance of local spices and lively debates among market vendors. Once you’ve taken it all in, you will obviously take something back with you–whether that something is physical or merely the mental souvenir of the experience. Find out more: Read more about The Shuk (Mahane Yehuda Market) on Wikipedia. Tip: For groups, the best plan is to pick a time and place to meet before arriving on the bustling scene. There were over 20 of us and it only took about 11 minutes for everyone to get lost for over three hours. Join a kid-friendly tour or organize your own with the help of a local guide. The most affordable, accessible and easiest way to understand the layout of a very confusing city, and get your interests addressed and visited is through a guided tour. This way, families can pick which parts of Jerusalem might be of interest and then plan a tour accordingly. Children are a welcome addition to the appropriate tours, and the operators will have solid recommendations for these. Kids can ask all the questions that pop into their creative little minds and get them answered in a very proper and meaningful way. The Holy Land Tours tab on the Travel Composer website has some ideas and plenty of options for Jerusalem and tour companies Just Jerusalem and Guided Holy Land Tours both have numerous positive reviews from families with young children and options for teens as well. Tours throughout Jerusalem can be done via bus or foot or a combination. 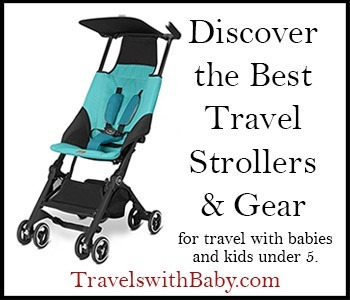 We did have a stroller with us, so try and remember these additions when booking a tour. Tell the tour operator if you have a wheel chair, stroller, or anything else that might make stairs or smaller alleyways with cobblestone difficult to traverse. Find out more: Visit TravelComposer.com. Tip: Tours vary in length, for families, breaking it up into two half days proved fruitful as the children were not overwhelmed or exhausted. Click upper right corner of map to open in a new window. Feature continues below…. Qubbat al-Sakhra or the “Dome of the Rock,” Jerusalem. The iconic location sits on a hill right next to the Old City of Jerusalem. It’s considered a Holy Site by many religions for eternity (or at least since human existence, it is argued). As with many structures in Jerusalem, buildings have been created, demolished, and reconstructed on top of the same site over the centuries and this serves as a perfect example. Today, the Dome of the Rock on Temple Mount is very important to the Muslim faith. Tourists may tour around the building, but only Muslims may enter the Dome of the Rock. Find out more: Click here to read more about the Temple Mount and Dome of the Rock. A family room at the Dan Jerusalem Hotel. Though the layout is bizarre (it’s an upside down hotel with the guest rooms below the main lobby), the hotel has everything families need, including family rooms and connecting rooms, and two free kids clubs including Playstations, wii, futsal court, and a kiddie pool (availability varies by season, check with hotel to avoid disappointment). Falafel is the perfect easy meal out on your visit to Jerusalem with kids. The most famous export from Israel is certainly falafel and pita, and in Jerusalem you can get it EVERYWHERE! It’s on virtually every street corner and there are stands open at all hours. Each and every person has his or her favorite stand. Personally, I enjoyed Moshiko Falafel on Ben Yehuda Street. A lot. And now, what’s one of my favorite memories of our own multi-gen trip? Watching my two older children rip their teeth into pitas dripping with tahini and spices as the tin foil and wax paper began to ooze with dressing, and little their smiles leaked tomatoes. We knew they got it. Julie contributes over 75 travel stories per year to various outlets including: AAA, USA Today’s 10Best, Cowboys & Indians, Family Vacation Critic, Aspen Magazine, The Broadmoor, Colorado Meetings + Events, Mile High Mamas, Colorado Parent, Mountain Magazine and many more. She is the State’s #1 agritourism writer, covering more ground and events and publishing in more outlets than any other Coloradan journalist. Julie travels in search of fields, farms, families and more. Sometimes . . . she finds herself in often uncovered, or understated locales, which has since become her niche. Follow her on Facebook: Slow and Go Traveler, and Instagram: @slowandgotraveler.